I spotted this beer with a German-looking name and was unable to resist grabbing one. A closer look at the description on the can (what I could read of it, anyway) revealed that it’s not actually a German beer. 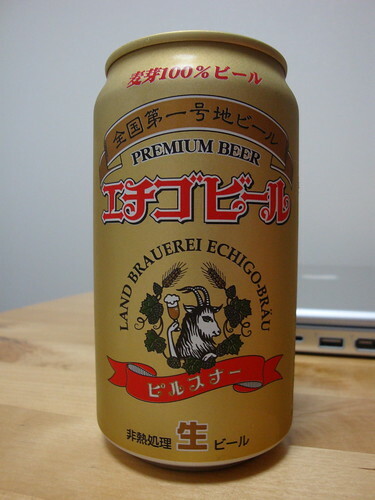 It’s brewed here in Japan by Echigo breweries using aroma hop from the Czech Republic. Either way, it’s a pretty good beer, and it more than made up for the disappointment of the not-Ginger-Beer Ginger Draft. Like the Eku Pils it’s not as bitter as a German (or Czech) pilsner. More like a Munich helles Bier. Definitely another one to add to the list of replacements for my ever-decreasing supply of German beer (I’m well into the last crate now). It doesn’t seem to be a limited edition, so I hope it’ll still be available next time I’m at the shop. If not, their website has a online shop that seems to have quite a range of beers. This entry was posted on February 17, 2009 at 21:34 and is filed under Japan. You can follow any responses to this entry through the RSS 2.0 feed. You can leave a response, or trackback from your own site. Ah yes, had that one before. Unfortunately it’s local to Niigata, so not so easy to find in Tokyo. I found their blonde beer in another supermarket yesterday. I prefer the Pils though. Aldgate in Shibuya have Jever Pils on tap as a regular beer. Cataratas in Shibuya have a Pils festival this week – a couple on draft and several bottles. Expensive little place though. For me Japanese Pils are often too sweet. Good that you can get Pilsner Urquell here! I read about the “monthly beer” on your blog, and was thinking about looking into it, but then forgot.